Order by 4.30pm on Thursday 14th June and select Next Day Delivery at the basket page to ensure your gift arrives in time! This compact set has everything your dad needs for shaving and cleansing while he’s away. It includes a hair & body wash, aftershave balm, shave cream and miniature eau de toilette of the indomitable, energising Nomad fragrance to keep him smelling great on the move. 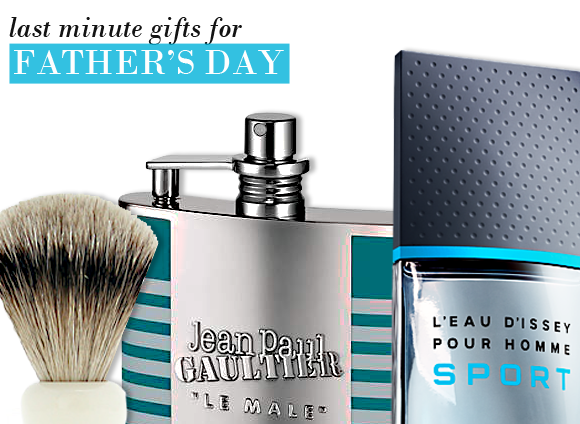 Introduce your dad to the bestselling range of Clarins skincare with this handy suits-all kit. Cleansing, moisturising, shaving and showering covered in four great products, and there’s also a miniature Clarins Fatigue Fighter to give your dad’s skin an added boost of energy. Wild, fresh and inspired by the world of extreme sports, Issey Miyake Pour Homme Sport is the perfect fragrance to set your dad up for a summer of sport. Already extremely popular, the invigorating scent leaves an impression of grapefruit, nutmeg and vetiver. This classic fragrance has been repackaged in a fun flask shaped bottle for easy summer travelling. It fits snugly into pockets, bags and luggage for an instant boost of the cooling mint, lavender and vanilla scent wherever your dad finds himself on his travels. If your dad is a more traditional sort of guy, this pure badger hair brush is really something special. It creates a perfect lather of soap or shave cream on the face, and feels luxurious on the complexion. With proper care it should serve your dad for years! I bought this product as a Christmas present to a dear friend, who will enjoy the traditional brand image and appreciate the quality. He travels and this neat little package will be just the job. This entry was posted on Tuesday, June 12th, 2012 at 10:13 am and is filed under Fragrance, Gifts, Men. You can follow any responses to this entry through the RSS 2.0 feed. You can skip to the end and leave a response. Pinging is currently not allowed.